Like most Civil War bloggers, I get occasional requests to promote/review books or other works. Most are simply advertising and, unless very closely related to the combat at Sharpsburg in 1862, not usually right for this space. But I got a nicely written email from Terry Goldman representing the History Channel offering a full press kit and web goodies promoting their upcoming film Sherman’s March (airing 22 April 2007). 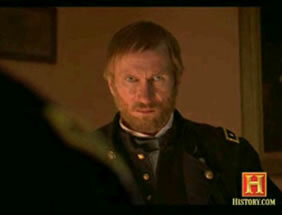 A teaser video says its a ‘spectacular reenactment’ and ‘psychological profile’ of William T Sherman. I don’t know anything else about the show, but I think Terry’s courteous and professional approach to publicity deserves a little airtime here. I just now finished viewing “The History Channel’s” version of Sherman’s march to the sea. What a waste of time. Just another attempt at the ethnic cleansing of the South. You see, my Great Grandfather was part of all of that. There are still some Southerners that know what really happened during that dreadful period of American history. Descendant of Pvt. J.M. Dean, K Company, 53rd. Reg’t. Alabama Cavalry (Partisan Rangers) Gen. J. Wheeler’s Cav. Army of Tenn. C.S.A. Enjoyed the program last night, although on balance, it was a pro-Sherman account. It made no mention of Sherman’s rebuke by Lincoln’s cabinet of the generous surrender terms Sherman offered to Joe Johnston’s forces in early 1865. I tuned in to the History channel last week to see the historical account of Sherman’s March across Georgia. Instead, I saw a terrorist being glorified and his actions being justified. The opening scene with the map of “slave and free states” was inaccurate and it went downhill from there. Little from the Confederate perspective was included. Details of Griswoldville, Cassville, the terrorist soldiers with their wagons, horses, and pockets loaded with stolen personal property and leaving in their path complete destruction of anything useable or edible were omitted. Women and children were left homeless and starving with winter approaching. Had there been a legitimate War Crimes Commission at the time, it would have been Sherman and not Henry Wirz to hang from a gallows. Sorry to be slow reponding, David. Let me say I appreciate all the work you must have done to find all these quotes. I don’t know that anyone would argue Sherman was a great humanitarian, though – the arguments seem to revolve around (1) how severe was the destruction/civilian impact in Georgia, (2) was Sherman’s policy military necessity, and/or (3) did it shorten the War. No question where you stand! Dear, Brian I am inclined to present a presentation and 15 page essay to my American History 1 class by May 11, 2007. I would be overly delighted to have some book references or factful websites ending in .gov or .edu for my required 8 references I am to use. 5 book citations and 3 websites. My title for my research paper is William T. Sherman Hero or Terrorist. I would not at all mind to here your view on this matter. Okay bAotW readers: any help for Dustin here?